I'm a 17 year old girl who tore her right ACL skiing on December 21st, 2009, after poorly landing a jump in the terrain park. It hurt for about 20 seconds after the initial "pop," but felt alright (some minor instability), at least enough for me to ski another 2 hours to complete the day. 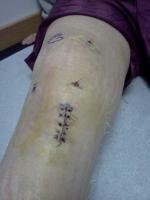 After the swelling and stiffness increased, I went to my ortho on Dec 23, who thought I had a meniscus tear. The MRI results showed that it was a complete ACL tear with minor damage to the meniscus. Since I am a student at a university with a dauntingly large campus, I have to have my surgery over one of my breaks in order to ensure enough recovery time before going back to classes. I had the option to have surgery on Dec 24 or wait until spring break (mid-March) or summer break (mid-June). I decided to wait, in order to gain more information about the surgery and regain some movement in my knee before the surgery. Now I'm faced with the task of choosing when to have the surgery, as well as what type of graft to choose. If I have surgery in March, I'll be back to trying to maneuver my campus on crutches (ugh) and will have to balance the rigorous physical therapy with classes. If I have surgery in June, there will be an increased amount of time before I am able to return to my normal athletic activities, and my entire summer will be filled with knee pain. When it comes to deciding the graft type, I'm lost. I've heard that the patella allows for a faster and stronger recovery, but can cause knee pain when kneeling and often leads to arthritis. The hamstring sounds as though it has a slower, weaker recovery process but with fewer long-term complications. None of my options sound appealing AT ALL; I don't want to crutch around campus OR wait another 3 months to ski, hike, and play tennis again. And after watching a video of the grafts being removed, blegh.